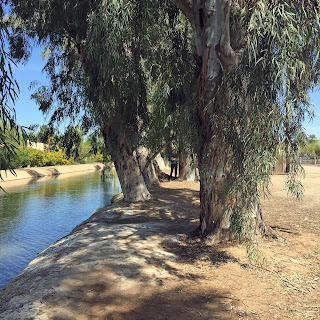 Let's follow the water of the Salt River, beginning in Scottsdale and ending in Peoria, Arizona. If your first response is "hey, there's no water in the Salt River", sorry, you're just looking in the wrong place for the water. The Salt River marked on maps is just an empty gouge that goes south of the airport. 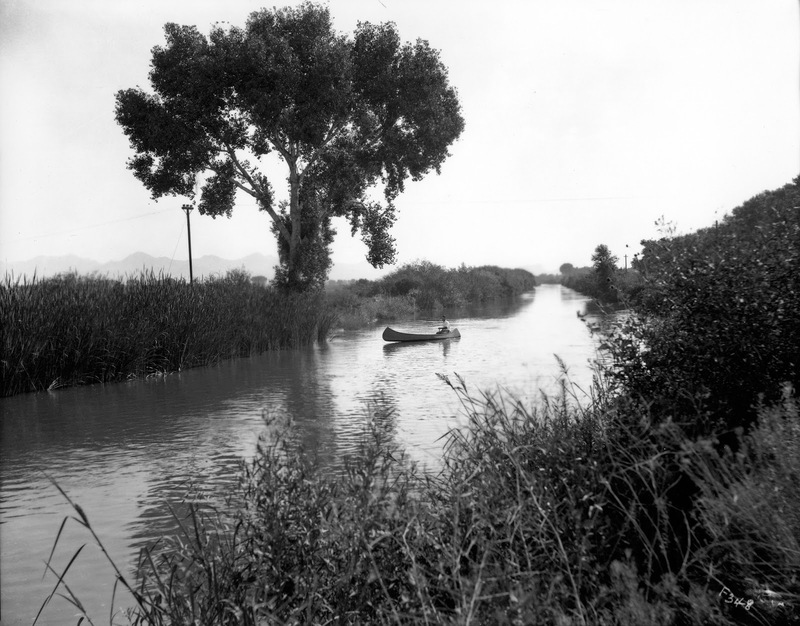 There's some water over by Tempe, but most of the water of the Salt River flows through the canals, and has done so since the 1880s. 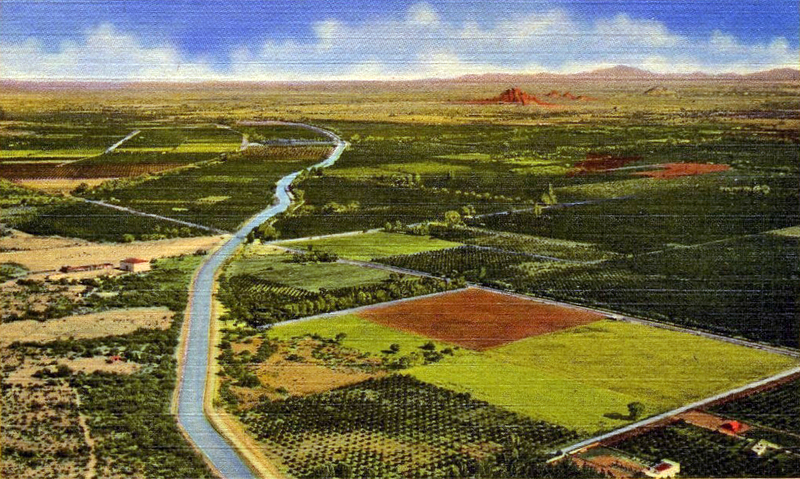 Let's start in Scottsdale, at Pima Road a little over two miles north of Indian School Road. 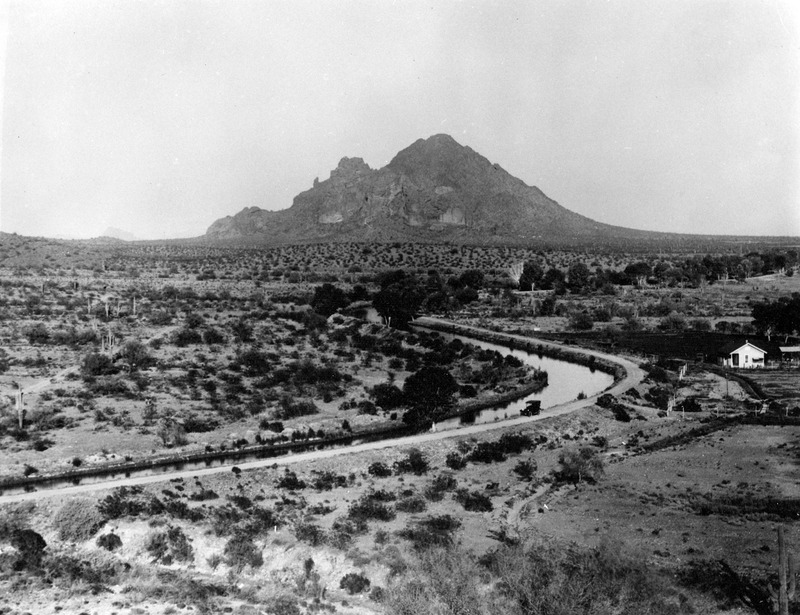 We could have started further east, in the Salt River Pima–Maricopa Indian Community, or even as far back as Roosevelt Dam, but it's a long trip, so this will make it shorter. And we will go most of the way across the valley! But don't worry, we won't need to paddle our little boat very much, we will be going with the current, as the valley slopes west-southwest. 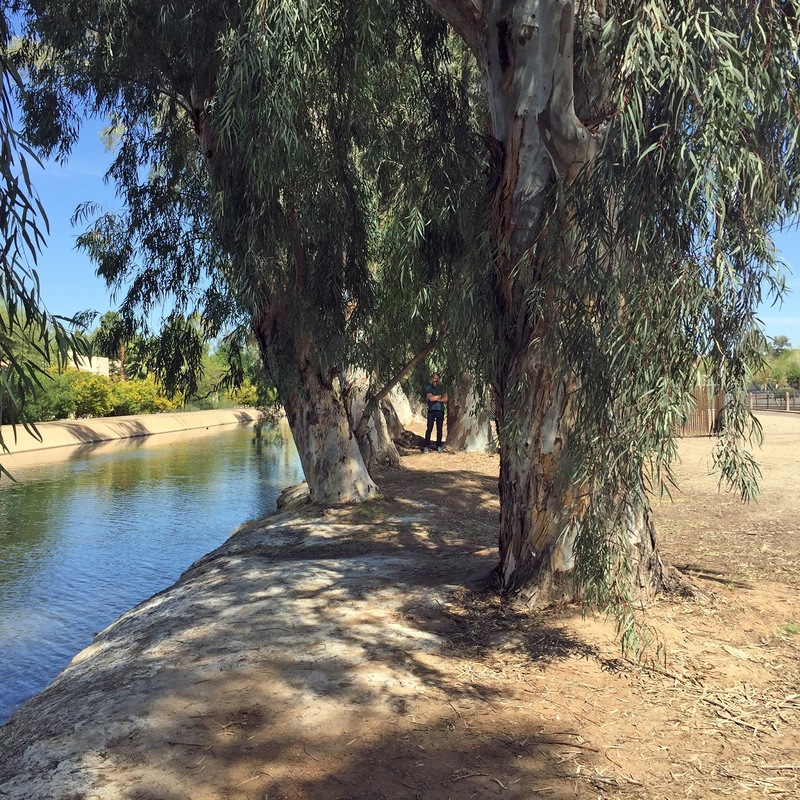 We're on the Arizona Canal. 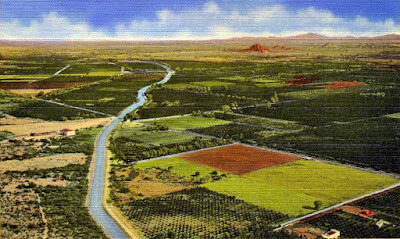 We will be traveling due west until just past Hayden, when the canal takes a sudden bend south at, appropriately enough, Indian Bend Road. It will begin its gentle curve back west as we approach the intersection of Scottsdale Road and Camelback. It's clear sailing until we get to about 56th Street, and we'll need to carry the boat around the falls. Don't worry, there are stairs nowadays. And there's a beautiful view of Camelback Mountain. Arizona Falls, just north of Indian School, east of 56th Street. The falls are still there, and there's a little park, too. Looking east at Camelback Mountain along the Arizona Canal from the hill of the Wrigley Mansion. Now the canal starts to go north, continuing to parallel Indian School Road. As we approach 32nd Street, we can see the Arizona Biltmore, which we go right past, between the main buildings and the golf course. We get a nice view of Piestewa Peak, which used to be called Squaw Peak. Past 24th Street we see the water treatment plants, and as we go under the I-17 freeway, we approach Metrocenter, and another water treatment plant. By the way, these treatment plants are for the fresh water that we use every day. You know, the water that comes out of your tap when you make coffee in the morning. Salt River water. Once we pass 51st Avenue, the diversion channel begins to widen out into Thunderbird Paseo Park. Just past 75th Avenue we can see Arrowhead Towne Center just to the north, on Bell. We are in Peoria. 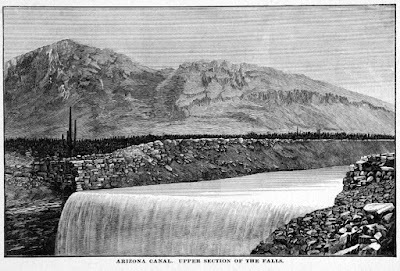 And now the Arizona Canal ends, and the water from it pours out into the diversion channel, to join up with Skunk Creek, New River, the Agua Fria River, the Gila River, then down to Yuma and out into Baja, California and into the Pacific Ocean. Thank you for floating along with me on the water of the Salt River.